Hello crafters! It is Monday again, and we had a nice weekend full of activities. A new play ground was opened and the kids absolutely loved it. We also had elections yesterday, and I took a lovely forest walk after voting, photographing mushrooms and other signs of autumn. On top of that, we visited some farm animals, built lego, and made apple mash and apple pie (I got lots of apples from friends). It's a big apple year here this year, and the trees are full of apples. Our favorite way of eating apple mash is to take it from the freezer and let it defrost a little bit, but to eat it before it has defrosted completely. I think we discovered this as children, when we were too impatient for the apple mash to defrost before eating it. 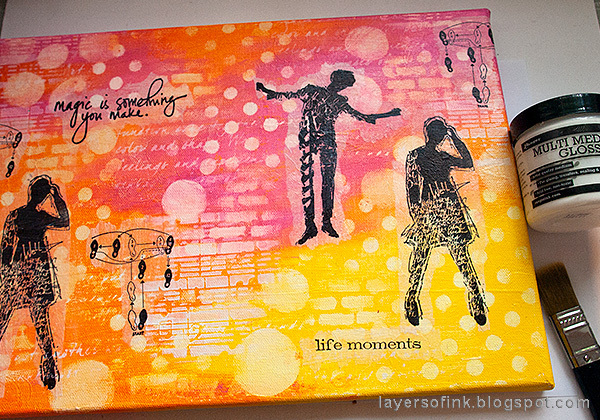 Our theme this week at the Simon Says Stamp Monday Challenge Blog is: Use More Than One Stencil. Fun! Don't miss the project by our September guest designer Terelisa Agosti. I made this canvas as a birthday gift to a good friend of mine. 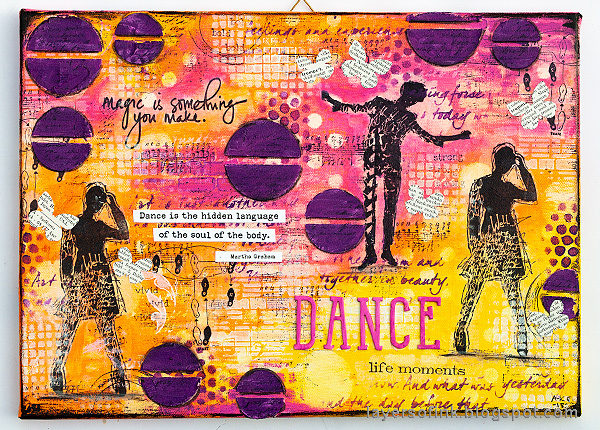 Dancing is one of her big interest, so it was easy to pick the theme for the canvas, which is also full of significant little details and words. I also used a color combo that I know that she likes. 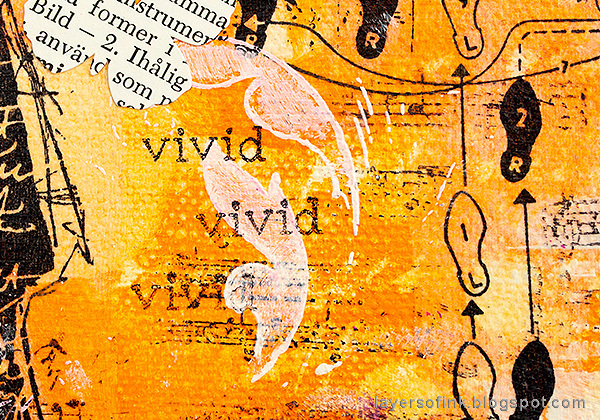 The background is built up with layers of acrylic paint, stenciling and stamping. You can of course use the techniques for any type of theme. The canvas is 33 x 24 cm or 13 x 9.5 in. Start by coating a canvas with gesso. When the gesso is dry, paint it with acrylic paints. I used Dina Wakley's paint and also added some of her Glazing Medium to the paint, which gives you a little more time before the paint dries. Before the paint is completely dry, use various stencils and rub through them with a slightly moist cloth. This will remove paint. To make it easier to rub, I placed a Sizzix L Bigz die under the canvas. You can also use a book. The big dots come from the SSS Irregular Dots stencil. The easiest way to stamp on a flexible surface such as a canvas, is to stamp the images on tissue paper first. Stamp on the glossy side of the paper with a waterproof ink. 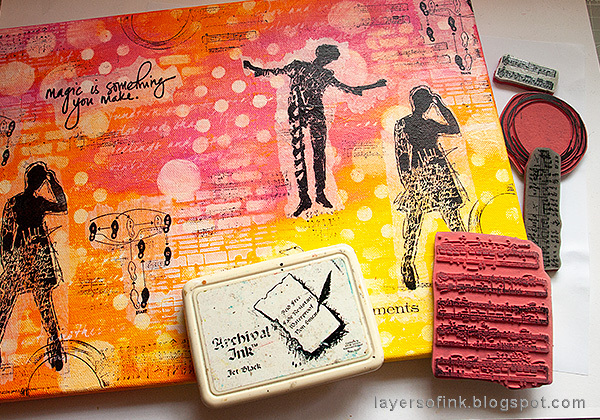 I used stamps by Dina Wakley and Tim Holtz. The women come from Dina's Silhouetted Women set. Stamping on tissue paper also makes it easy to plan the design. Tear around the images and move them around until you are happy. A torn edge disappears much easier than an edge cut with scissors. 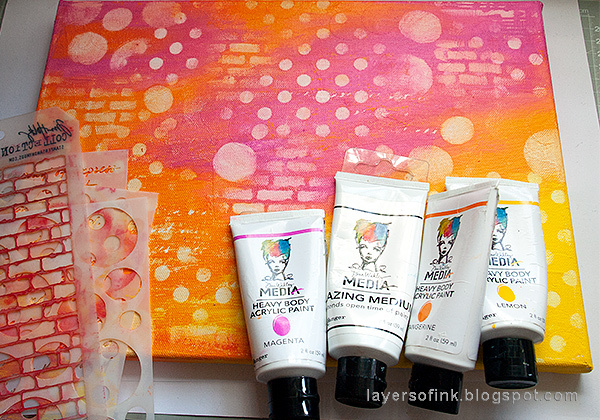 Use gloss multi medium to adhere the tissue paper to the background, working one image at a time. First, paint a thin layer of gloss multi medium where you want to place the image. Carefully place the image and then add another layer of medium on top. As you can see, some of the edges disappeared completely, others are more visible - it depends on the color of the paint underneath. We will eventually make them all disappear. 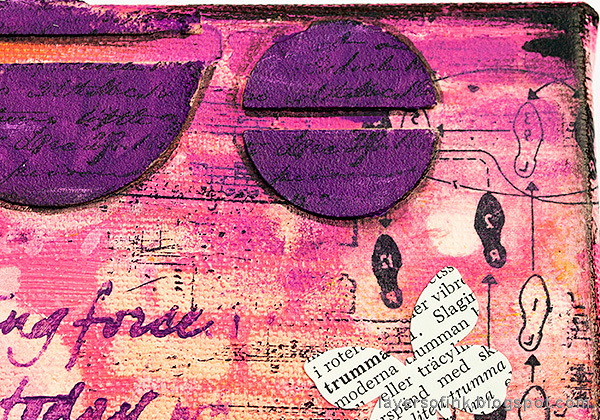 I stamped the background with a circle stamp and various musical note stamps. Using the same paints as before, I painted over the areas where the tissue was still visible, and also added more stenciling through a bubble, brick, art definition, and a musical notes stencil. 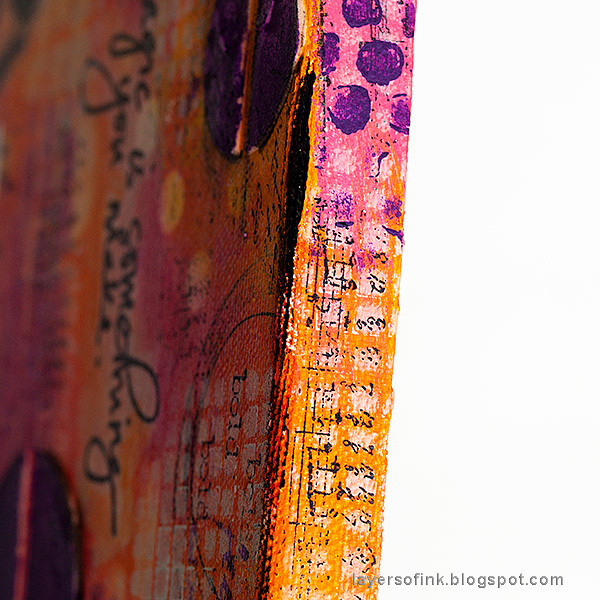 I really like Dina's Halves stencil and here I applied Embossing Paste through it. Let dry. Place the stencil back on top of the halves and paint them purple. When the paint is dry, add a shadow with a Black Soot marker, blending with your finger. 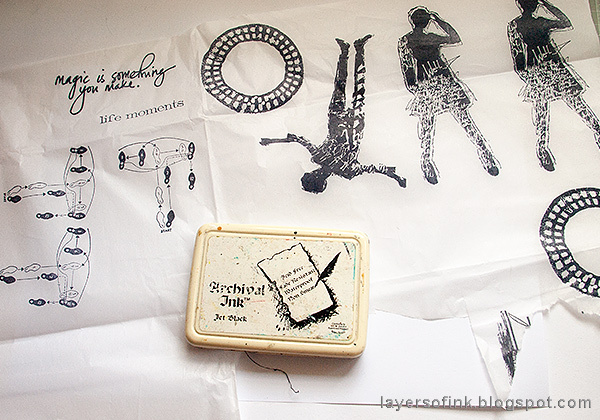 Place the stencil back over the halves and stamp them with a script stamp and black ink. I forgot to take a photo of these two steps. At this stage, I felt that the canvas needed more white, and I rubbed white paint through Tim's Linen stencil. I also die cut butterflies with the Springtime Side-Order set, picking words related to dance and music in an old word book. 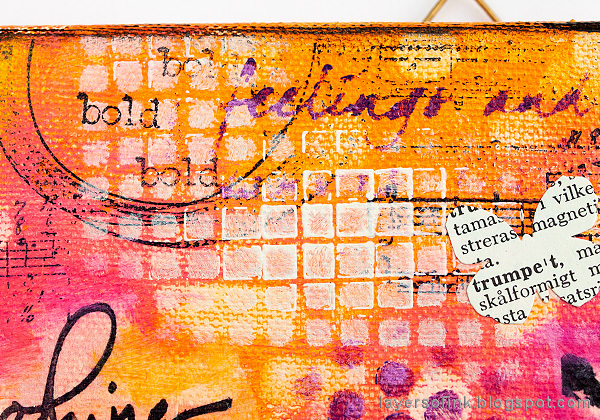 I also added more stamping, using small words from Dina's All The Gals set, which fit the theme of the canvas. 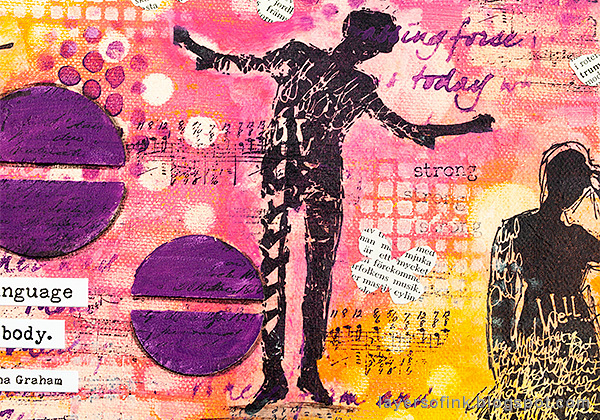 This is one of my favourite sentiment stamps, I've used it in my art journals too. 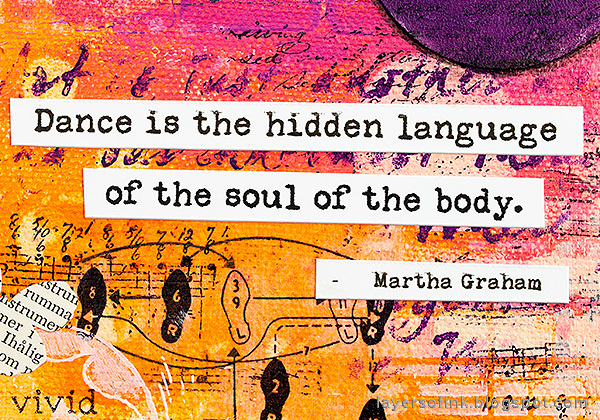 I looked for a quote about dancing, and thought this one fitted well. The fun dance step stamp comes from Tim's Purely Random set. To ground the dancers to the canvas, I simply added a floor and a small shadow underneath them. 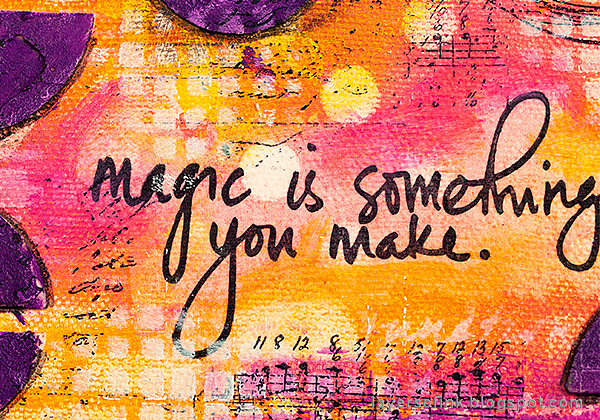 You can add more stamping or stenciling where you feel that something is missing, or to cover up mistakes. 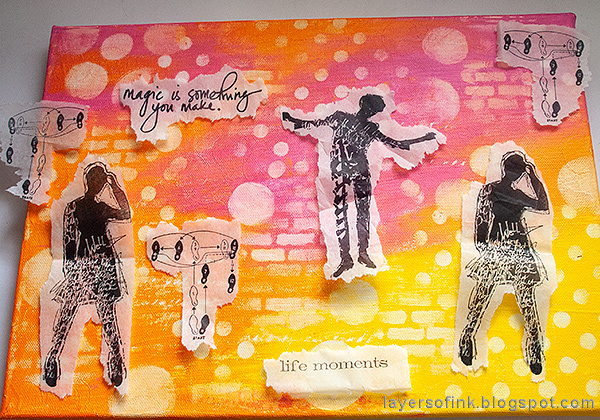 The title was die cut from mat board using Tim Holtz's Broadway Alpha Sizzix die, and painted pink. There are also some white stencil swirls. I love these small word stamps and reach for them often. 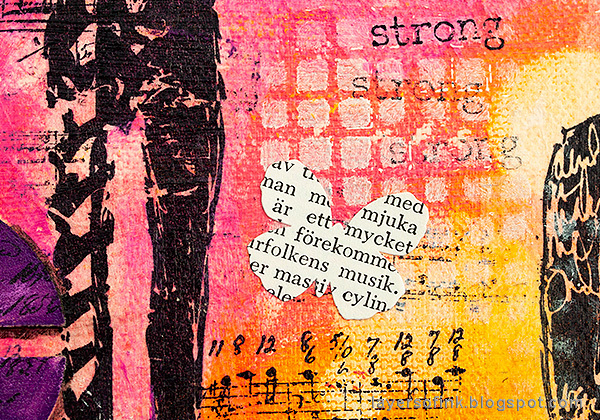 Building up layers with stencils and stamps is a lot of fun and makes for an interesting looking background. I also extended the design to the edges of the canvas. This is even more fun if you'd have a deep edge canvas. At first I was just going to use two women on the canvas, but three looked so much better, so I repeated this shape twice. I hope you will join us this week in our Use More Than One Stencil challenge and in celebrating STAMPtember®. As always, you have a chance to win a $50 gift voucher to do some fun shopping at Simon Says Stamp. You have until next Monday 8am Ohio time. 1pm UK time, 2 pm CET to join in. 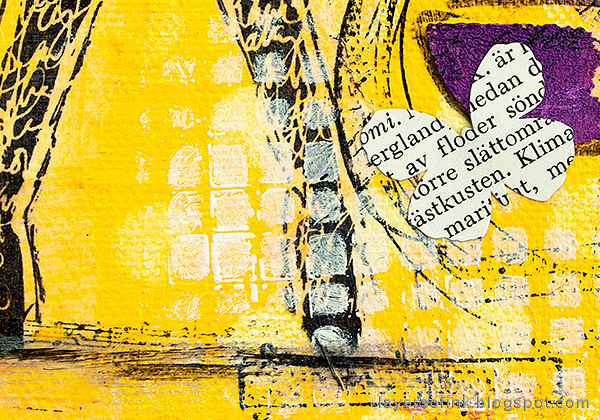 Incredible gift for your friend, Anna-Karin! The colors are gorgeous & love the stenciling! Your tutorials are always so clear & informative. Our apple crop was huge this year--still trying to make use of all of them. Great and fabulous. I think I have never used the purple with yellow combo and the effect is so vibrant and happy! 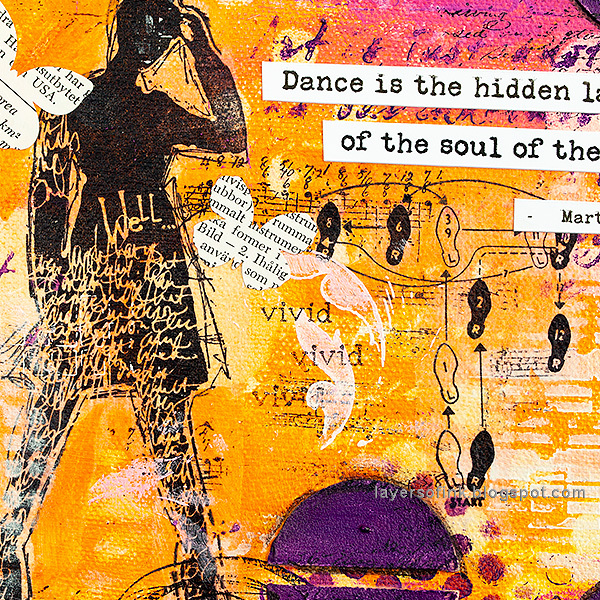 Besides, I love to dance so these pages talk to me so clearly :-) Hugs, Macarena. Fabulous sense of movement! 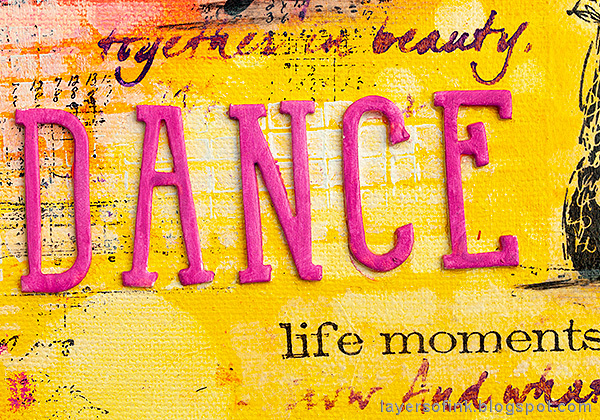 I really love the energy of this piece and I admire the way you are so brave with the different color palettes you use. 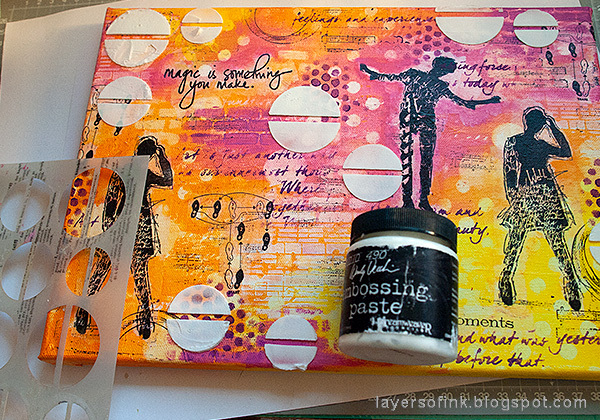 this is sucha beautiful art journal page, I love how perfectly you bleneded the color in your background!! 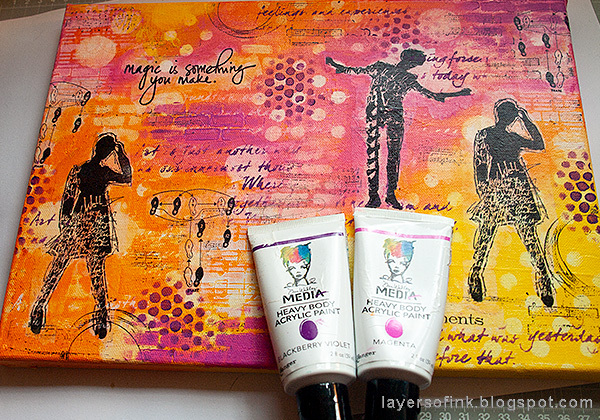 I have those girls and some stencils - as well as Canvas - hmmm - adding to m bucket list! TFS your tutorial!